It didn’t take long before strangers offered their thoughts on our newborn baby as we started to venture out of our cave and into the big wide world. So far, all of them have been positive …. One woman waiting at the pediatrician’s office even asked if she could take a photo of me and Aviana together because Aviana is so small she couldn’t believe it! Ok. So that was a bit weird! The cashier lady said to us she would have told her daughter off for going outside with such a young-un so soon. So this comment was a bit judgemental, but I don’t care, because we believe some fresh air is good for a baby! It’s not like we were passing our baby round lots of people!m. Yes, the pediatrician said we have to be careful because she is so tiny and we are on the brink of a flu epidemic in the local area as the kids go back to school. It seems the vaccine this year might not be effective for this type of flu. So we are being very careful where we go, who we hang out with and who gets to cuddle her. Finally, Chris carried Aviana around the shop on his chest as she was fussing a bit. A lady came up to me and gave her compliments on our cute daughter, then said (to me) ‘it’s so nice to see the man doing his part!’ She looked like she was about to tear up at the prospect of a man being an actual parent. I was a little surprised and later asked Chris how he felt about what the lady had said. He said that this was in no way offensive to us, but just reminded us that not every family has a father who plays the role of carer equal to the mother. Chris – parenting (a purple blob)!!!! 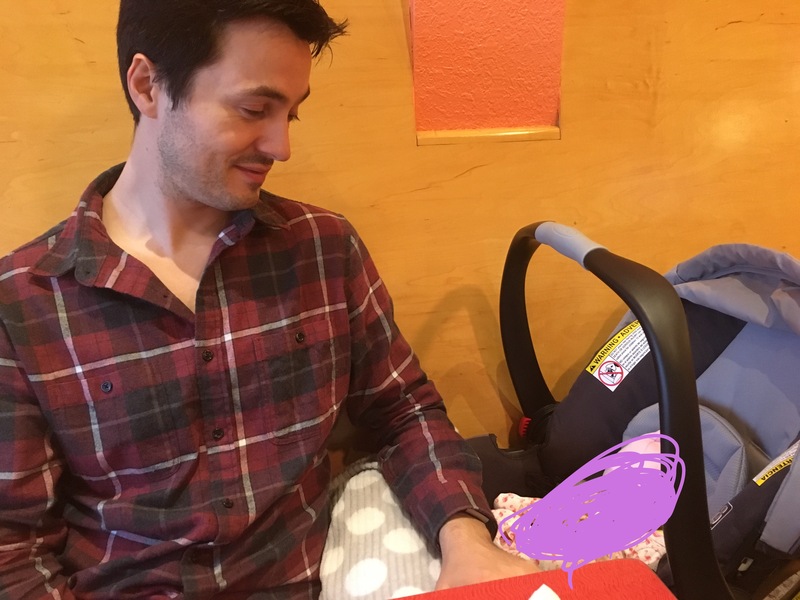 I know this is just the beginning of random strangers commenting on our daughter or our parenting skills…but what else will I fill this blog up with if not with opinions of people we don’t know ??!!!! Yes it really is just the beginning of random comments from strangers and people you know too. We had a lot of people commenting on our baby being out and about as young as 2 days old, in fact when we left the hospital our very first stop was a local grocery store. We didn’t really have a choice since we were living in a hotel without a kitchen or family to bring us stuff, but of course people didn’t know that! Also, I really have no idea how I would have reacted to a photo request! Oh yes and you went on a plane very early too with baby MPB! Yes the photo thing she caught me off guard as I was holding Aviana and trying to arrange the next appointment so I didn’t have time to think about it!!! I was in the picture too, I wouldn’t have wanted it to be just a picture of her that would be REALLY weird I think! People comment every single time we go out anywhere. I’ve taken C out and about with me from the very beginning…I feel like giving her some exposure to the world is better than sheltering her and then blasting her all at once and throwing her immune system into overdrive. I guess I’m just one of those lax, easygoing type of parents. I do hate that people give you all of their “helpful advice” though. “Well with my baby we (fill in the blank)” or “Oh I NEVER did (fill in the blank)”, or “You should be doing so-and-so not what you’re doing”, or “Why aren’t you (whatever is better than what I am doing)?”…I could go on for days. It drives me insane. I understand some people mean well, but most are very know-it-all and pompous about it, as if I’m the worst parent in the world! As far as I can see, my baby is happy and healthy, and that’s all that matters! So you keep on keepin on Dani, you’re doing a great job!! Yeyyy I can’t wait for all this kind of ‘advice’ 🤔!!!!!! They never end! I am a young mother and I have two kids with the same father ( we are still together). I get asked constantly if I’m done having kids and one woman had the nerve to tell me I shouldn’t try for more i have my hands full..I just ignore it most of the time. You know what’s best for your baby don’t let other people try and tell you otherwise! I had a cashier at the gas station in my hometown tell med she’d be happy to baby-sit. While the offer was very sweet, I think I’ll stick with all the volunteers that I have that I actually know, lol. That is so random!!!! Sweet….but random….maybe creepy too….!! !